The St. Thomas Aquinas Saints and Topeka Seaman Vikings both enter the Class 5A quarterfinals fresh off dominating victories. 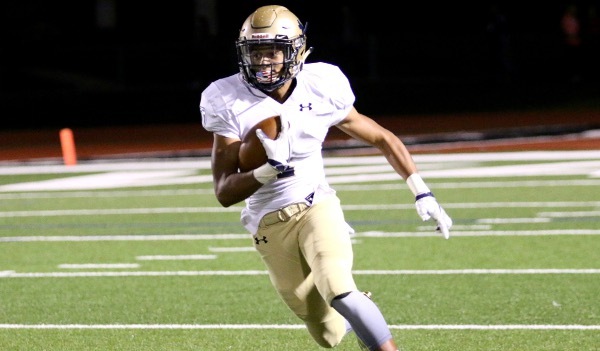 Aquinas scored the game’s first 42 points, en route to a 42-14 win over Bonner Springs. Drew Hicks led the way by rushing for 136 yards and two touchdowns. Meanwhile, Seaman is coming off a 62-14 victory against KC Turner. The Vikings scored 55 points in the first half, and Dalton Cowan passed for 140 yards and three touchdowns. The Saints have enjoyed two consecutive victories after stumbling a bit to end the regular season. Blue Valley Southwest earned its first win of the season by edging Aquinas 30-27 on Oct. 14. That was followed by a 45-34 loss to an undefeated Blue Valley team. Aquinas’ only other defeat came in Week 3 to Bishop Miege, which is the favorite to win Class 4A Division I.
Hicks is Aquinas’ leading rusher with more than 800 yards despite playing only seven games. As a team the Saints rush for nearly 300 yards per game and pass for almost 150. A win would put Aquinas in the state semifinals every year since Randy Dreiling took over the program in 2014. Glenn O’Neil has directed the Vikings to a dramatic turnaround in his first season as the head coach. Seaman is 8-2 a year after finishing 2-8. The Vikings’ only losses were to a pair of 6A schools in Manhattan and Junction City. Seaman boasts a balanced offense, averaging 160 yards through the air and 175 yards on the ground. Dalton Cowan has completed nearly 60 percent of his passes for 1,606 yards and 17 touchdowns with only two interceptions. Cowan has also rushed for 402 yards and four touchdowns. Senior Nick Steiner leads the receivers with 42 catches for 688 yards and nine touchdowns. This is Seaman’s first season to advance past the first round of the playoffs since 2010. Goddard proved it was among the Class 5A elite with its 20-12 home win against Bishop Carroll. Wichita Heights (9-1) defeated Emporia, 42-7, at home, but fell 42-41 to the Golden Eagles earlier in the year when Carroll delivered a furious comeback. Goddard is No. 1 in 5A in scoring defense with a collective margin of 42-14.6. Heights has the top offense with an average score of 44.6-17.8. Goddard has played the No. 4 SOS, Heights No. 24. Last week, Heights pulled away in the second half against Emporia with a 28-0 run. Sophomore quarterback K’Vonte Baker rushed for 199 yards, while tailback Ontario Russell had 164 rushing yards and three touchdowns. Russell had scoring runs of 66, 53 and 29 yards. Heights collected 462 rushing yards. Physical Dejaun Scott is also key in the backfield. In the Carroll contest, the Golden Eagles rallied from a 34-14 deficit to beat Wichita Heights. Heights ran 52 plays for 526 yards, while Carroll had 75 snaps for 501 yards. In Week 7, Heights narrowly held off Kapaun, 24-21, but the Falcons controlled the game throughout and led 24-7 entering the fourth quarter. Kapaun stopped Heights on the 1-yard line and then scored late after a fumble. Even in that contest, Heights finished with 47 plays for 423 yards. Even in other key games, Heights has always moved the ball well. In a Week 1 matchup versus Olathe North, Heights had 49 carries for 433 yards. In Week 9, Heights delivered 55 points and 581 total yards (480 rushing) against Wichita South. Heights averages more than 410 rushing yards a contest. Goddard’s defense intercepted Carroll quarterback Braden Howell six times after Howell had thrown just five picks in the first nine weeks. In the second quarter, Dayton Driskill returned an interception 100 yards for a score. The Lions received a pair of fourth-quarter touchdowns from senior tailback Kody Gonzalez. Gonzalez finished with 128 rushing yards, while Blake Sullivan rushed for 127. Carroll won the yardage battle 359-300 and ran 10 more plays than the Lions, which advanced to its first quarterfinal since ’07 when it eventually reached the semifinals. Goddard’s offense is much more balanced with 428 total yards a contest, including 150 passing. Sullivan has accounted for 2,313 yards and 35 scores, while Gonzalez has 1,459 rushing yards and 14 TDs. Defensively, seniors Ethan Wright and Trent Johnson, along with junior Justin Amaro, have combined for 37 TFLs. Senior Myael Williams has recovered six fumbles and Amaro has collected five. Senior Cale Davidson has three blocked kicks. Goddard has forced 27 turnovers and is plus-15 in turnover margin. Last year, the Lions went 6-4 but were minus-3 in turnover margin. Heights defeated the Lions, 41-27, in the playoffs last season, the only matchup in more than a decade. Goddard’s turnover creation is outstanding and a huge reason for the Lions’ big turnaround. Heights has struggled when one of two aspects have occurred – turnovers (Kapaun game) and quick-strike passing (Carroll). The game will likely be decided on how many turnovers Goddard’s defense forces, and whether the Lions can produce enough plays in the passing game.